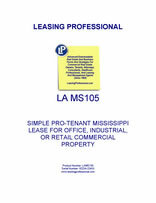 This form is for a single tenant Mississippi lease where the tenant has superior leverage. It gives the tenant the right to use the premises for "any legal use," and has very abbreviated remedies for the landlord in the event of a tenant default. It is also pro-tenant in character because of the clauses it does not contain which customarily appear in pro-landlord forms relating to remedies and a variety of other pro-landlord provisions. Mississippi made a decision in 1990 to legalize casino gambling along the Mississippi River and the Gulf Coast, which has led to economic gains for the state. However, an estimated $500,000 per day in tax revenue was lost following Hurricane Katrina's severe damage to several coastal casinos in August 2005. Gambling towns in Mississippi include the Gulf Coast towns of Bay Saint Louis, Gulfport and Biloxi, and the Mississippi River towns of Tunica, Greenville, Vicksburg and Natchez. Before Hurricane Katrina struck the Gulf Coast, Mississippi was the second largest gambling state in the Union, ahead of New Jersey and behind Nevada.